Habitat for Humanity International is a nonprofit, ecumenical Christian housing ministry. HFHI seeks to eliminate poverty housing and homelessness from the world, and to make decent shelter a matter of conscience and action. 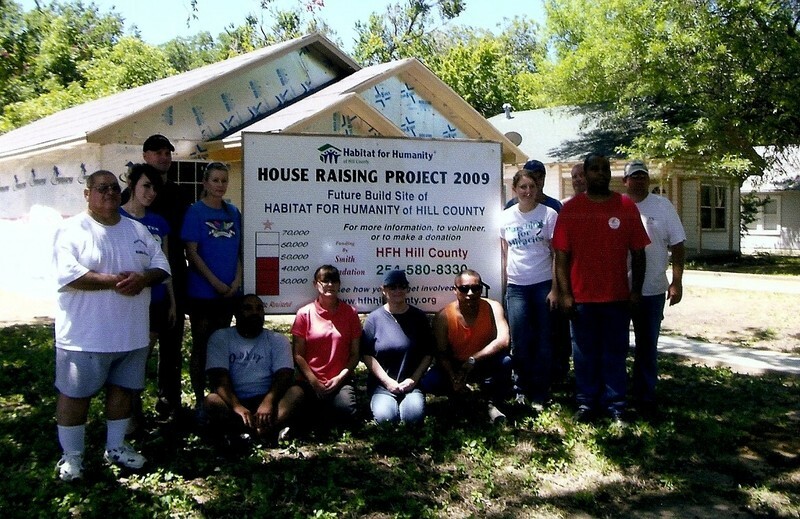 Habitat For Humanity of Hill County works in partnership with God and people of all faiths and races to develop communities for people in need by building houses and creating homeownership opportunities. We build cost effective homes which we sell at cost to qualified low income families. The next home we build will be in Itasca. The City has donated the lot and we are working on funding construction. We have several Fund raising events scheduled. To find out more about upcoming events ake a look at our calendar to find out what is scheduled. This will be a big year for HFHofHC. In January we began a partnership with HFH International to revitalize HFHofHC. This is an opportunity to receive guidance and training from our National organization. Also in January we begin working with the HFH of Nacogdoches Mentoring program. We will visit our Nacogdoches affiliate to learn from them and to meet our Mentor. Then in February our HFHI representative and our mentor from Nacogdoches will be in Hillsboro. We are happy to announce a new service for Hill County. We are accepting applications for Home Maintenance and Repair. This includes "A Brush with Kindness" which is an exterior preeservation service that offers painting, landscaping, weather stripping and minor repair services for homeowners in need. Home Repair is a set of repairs to an existing home, based on an audit that makes the home a safe and decent place to live. Home Repair helps low-income homeowners, who struggle to pay their energy costs, by creating safe and energy-efficient homes. Home Repair is part of Habitat’s broader community development strategy, a holistic approach, which assists communities as well as families. It helps revitalize neighborhoods by creating affordable, safe housing and improving the comfort and wellbeing of families. Our next home will be in Itasca. We are well on the way with funding and hope to start building later this year. 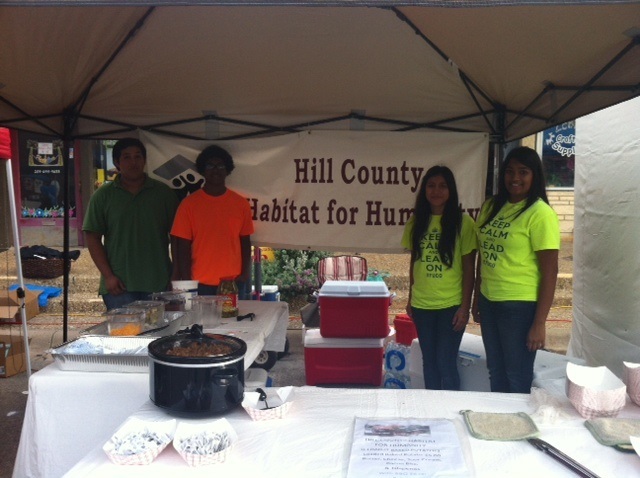 HFH of Hill County has several openings on committees and on the board of directors. If you are interested in helping others and would like to donate a few hours each month to serve families in Hill County we would like to hear from you. Please give us a call at 254 582-3070 or complete our Online Registration form to Volunteer. If you would like to make a donation or volunteer please contact us through this web site or email or give us a phone call at 254 582-3070. Whitney Pioneer day HFH of Hill County Loaded baked potato sale.